Not to be confused with Photinus. Plotinus (/plɒˈtaɪnəs/; Greek: Πλωτῖνος, Plōtinos; c. 204/5 – 270) was a major Greek-speaking philosopher of the ancient world. In his philosophy, described in the Enneads, there are three principles: the One, the Intellect, and the Soul. His teacher was Ammonius Saccas, who was of the Platonic tradition. Historians of the 19th century invented the term Neoplatonism and applied it to Plotinus and his philosophy, which was influential in Late Antiquity. Much of the biographical information about Plotinus comes from Porphyry's preface to his edition of Plotinus' Enneads. His metaphysical writings have inspired centuries of Pagan, Islamic, Jewish, Christian, and Gnostic metaphysicians and mystics. Porphyry reported that Plotinus was 66 years old when he died in 270, the second year of the reign of the emperor Claudius II, thus giving us the year of his teacher's birth as around 205. 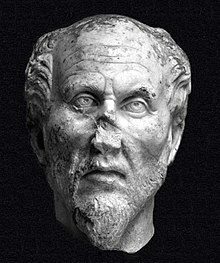 Eunapius reported that Plotinus was born in the Deltaic Lycopolis in Egypt, which has led to speculations that he may have been a native Egyptian of Roman, Greek, or Hellenized Egyptian descent. Plotinus had an inherent distrust of materiality (an attitude common to Platonism), holding to the view that phenomena were a poor image or mimicry (mimesis) of something "higher and intelligible" (VI.I) which was the "truer part of genuine Being". This distrust extended to the body, including his own; it is reported by Porphyry that at one point he refused to have his portrait painted, presumably for much the same reasons of dislike. Likewise Plotinus never discussed his ancestry, childhood, or his place or date of birth. From all accounts his personal and social life exhibited the highest moral and spiritual standards. Plotinus took up the study of philosophy at the age of twenty-seven, around the year 232, and travelled to Alexandria to study. There he was dissatisfied with every teacher he encountered until an acquaintance suggested he listen to the ideas of Ammonius Saccas. Upon hearing Ammonius lecture, he declared to his friend, "this was the man I was looking for," and began to study intently under his new instructor. Besides Ammonius, Plotinus was also influenced by the works of Alexander of Aphrodisias, Numenius, and various Stoics. After spending the next eleven years in Alexandria, he then decided, at the age of around 38, to investigate the philosophical teachings of the Persian philosophers and the Indian philosophers. In the pursuit of this endeavor he left Alexandria and joined the army of Gordian III as it marched on Persia. However, the campaign was a failure, and on Gordian's eventual death Plotinus found himself abandoned in a hostile land, and only with difficulty found his way back to safety in Antioch. At the age of forty, during the reign of Philip the Arab, he came to Rome, where he stayed for most of the remainder of his life. There he attracted a number of students. His innermost circle included Porphyry, Amelius Gentilianus of Tuscany, the Senator Castricius Firmus, and Eustochius of Alexandria, a doctor who devoted himself to learning from Plotinus and attending to him until his death. Other students included: Zethos, an Arab by ancestry who died before Plotinus, leaving him a legacy and some land; Zoticus, a critic and poet; Paulinus, a doctor of Scythopolis; and Serapion from Alexandria. He had students amongst the Roman Senate beside Castricius, such as Marcellus Orontius, Sabinillus, and Rogantianus. Women were also numbered amongst his students, including Gemina, in whose house he lived during his residence in Rome, and her daughter, also Gemina; and Amphiclea, the wife of Ariston the son of Iamblichus. Finally, Plotinus was a correspondent of the philosopher Cassius Longinus. While in Rome Plotinus also gained the respect of the Emperor Gallienus and his wife Salonina. At one point Plotinus attempted to interest Gallienus in rebuilding an abandoned settlement in Campania, known as the 'City of Philosophers', where the inhabitants would live under the constitution set out in Plato's Laws. An Imperial subsidy was never granted, for reasons unknown to Porphyry, who reports the incident. Porphyry subsequently went to live in Sicily, where word reached him that his former teacher had died. The philosopher spent his final days in seclusion on an estate in Campania which his friend Zethos had bequeathed him. According to the account of Eustochius, who attended him at the end, Plotinus' final words were: "Try to raise the divine in yourselves to the divine in the all." Eustochius records that a snake crept under the bed where Plotinus lay, and slipped away through a hole in the wall; at the same moment the philosopher died. Plotinus wrote the essays that became the Enneads over a period of several years from ca. 253 until a few months before his death seventeen years later. Porphyry makes note that the Enneads, before being compiled and arranged by himself, were merely the enormous collection of notes and essays which Plotinus used in his lectures and debates, rather than a formal book. Plotinus was unable to revise his own work due to his poor eyesight, yet his writings required extensive editing, according to Porphyry: his master's handwriting was atrocious, he did not properly separate his words, and he cared little for niceties of spelling. Plotinus intensely disliked the editorial process, and turned the task to Porphyry, who not only polished them but put them into the arrangement we now have. His "One" concept encompassed thinker and object. Even the self-contemplating intelligence (the noesis of the nous) must contain duality. "Once you have uttered 'The Good,' add no further thought: by any addition, and in proportion to that addition, you introduce a deficiency." (III.8.11) Plotinus denies sentience, self-awareness or any other action (ergon) to the One (τὸ Ἕν, to En; V.6.6). Rather, if we insist on describing it further, we must call the One a sheer potentiality (dynamis) or without which nothing could exist. (III.8.10) As Plotinus explains in both places and elsewhere (e.g. V.6.3), it is impossible for the One to be Being or a self-aware Creator God. At (V.6.4), Plotinus compared the One to "light", the Divine Intellect/Nous (Νοῦς, Nous; first will towards Good) to the "Sun", and lastly the Soul (Ψυχή, Psyche) to the "Moon" whose light is merely a "derivative conglomeration of light from the 'Sun'". The first light could exist without any celestial body. The One, being beyond all attributes including being and non-being, is the source of the world—but not through any act of creation, willful or otherwise, since activity cannot be ascribed to the unchangeable, immutable One. Plotinus argues instead that the multiple cannot exist without the simple. The "less perfect" must, of necessity, "emanate", or issue forth, from the "perfect" or "more perfect". Thus, all of "creation" emanates from the One in succeeding stages of lesser and lesser perfection. These stages are not temporally isolated, but occur throughout time as a constant process. The One is not just an intellectual concept but something that can be experienced, an experience where one goes beyond all multiplicity. Plotinus writes, "We ought not even to say that he will see, but he will be that which he sees, if indeed it is possible any longer to distinguish between seer and seen, and not boldly to affirm that the two are one." Superficially considered, Plotinus seems to offer an alternative to the orthodox Christian notion of creation ex nihilo (out of nothing), although Plotinus never mentions Christianity in any of his works. The metaphysics of emanation (ἀπορροή aporrhoe (ΙΙ.3.2) or ἀπόρροια aporrhoia (II.3.11)), however, just like the metaphysics of Creation, confirms the absolute transcendence of the One or of the Divine, as the source of the Being of all things that yet remains transcendent of them in its own nature; the One is in no way affected or diminished by these emanations, just as the Christian God in no way is affected by some sort of exterior "nothingness". Plotinus, using a venerable analogy that would become crucial for the (largely Neoplatonic) metaphysics of developed Christian thought, likens the One to the Sun which emanates light indiscriminately without thereby diminishing itself, or reflection in a mirror which in no way diminishes or otherwise alters the object being reflected. The essentially devotional nature of Plotinus' philosophy may be further illustrated by his concept of attaining ecstatic union with the One (henosis). Porphyry relates that Plotinus attained such a union four times during the years he knew him. This may be related to enlightenment, liberation, and other concepts of mystical union common to many Eastern and Western traditions. The philosophy of Plotinus has always exerted a peculiar fascination upon those whose discontent with things as they are has led them to seek the realities behind what they took to be merely the appearances of the sense. Authentic human happiness for Plotinus consists of the true human identifying with that which is the best in the universe. Because happiness is beyond anything physical, Plotinus stresses the point that worldly fortune does not control true human happiness, and thus “… there exists no single human being that does not either potentially or effectively possess this thing we hold to constitute happiness.” (Enneads I.4.4) The issue of happiness is one of Plotinus’ greatest imprints on Western thought, as he is one of the first to introduce the idea that eudaimonia (happiness) is attainable only within consciousness. The true human is an incorporeal contemplative capacity of the soul, and superior to all things corporeal. It then follows that real human happiness is independent of the physical world. Real happiness is, instead, dependent on the metaphysical and authentic human being found in this highest capacity of Reason. “For man, and especially the Proficient, is not the Couplement of Soul and body: the proof is that man can be disengaged from the body and disdain its nominal goods.” (Enneads I.4.14) The human who has achieved happiness will not be bothered by sickness, discomfort, etc., as his focus is on the greatest things. Authentic human happiness is the utilization of the most authentically human capacity of contemplation. Even in daily, physical action, the flourishing human’s “…Act is determined by the higher phase of the Soul.” (Enneads III.4.6) Even in the most dramatic arguments Plotinus considers (if the Proficient is subject to extreme physical torture, for example), he concludes this only strengthens his claim of true happiness being metaphysical, as the truly happy human being would understand that which is being tortured is merely a body, not the conscious self, and happiness could persist. Overall, happiness for Plotinus is "...a flight from this world's ways and things." (Theaet. 176) and a focus on the highest, i.e. Forms and the One. Henosis is the word for mystical "oneness", "union", or "unity" in classical Greek. In Platonism, and especially Neoplatonism, the goal of henosis is union with what is fundamental in reality: the One (Τὸ Ἕν), the Source, or Monad. As is specified in the writings of Plotinus on henology,[note 1] one can reach a state of tabula rasa, a blank state where the individual may grasp or merge with The One. [note 2] This absolute simplicity means that the nous or the person is then dissolved, completely absorbed back into the Monad. Here within the Enneads of Plotinus the Monad can be referred to as the Good above the demiurge. The Monad or dunamis (force) is of one singular expression (the will or the one is the good) all is contained in the Monad and the Monad is all (pantheism). All division is reconciled in the one, the final stage before reaching singularity, called duality (dyad), is completely reconciled in the Monad, Source or One (see monism). As the one, source or substance of all things the Monad is all encompassing. As infinite and indeterminate all is reconciled in the dunamis or one. It is the demiurge or second emanation that is the nous in Plotinus. It is the demiurge (creator, action, energy) or nous that "perceives" and therefore causes the force (potential or One) to manifest as energy, or the dyad called the material world. Nous as being, being and perception (intellect) manifest what is called soul (World Soul). Henosis for Plotinus was defined in his works as a reversing of the ontological process of consciousness via meditation (in the Western mind to uncontemplate) toward no thought (Nous or demiurge) and no division (dyad) within the individual (being). Plotinus words his teachings to reconcile not only Plato with Aristotle but also various World religions that he had personal contact with during his various travels. Plotinus' works have an ascetic character in that they reject matter as an illusion (non-existent). Matter was strictly treated as immanent, with matter as essential to its being, having no true or transcendential character or essence, substance or ousia. This approach is called philosophical Idealism. Since the 1950s, the Tübingen School of Plato interpretation has argued that the so-called 'unwritten doctrines' of Plato debated by Aristotle and the Early Academy strongly resemble Plotinus's metaphysics. In this case, the Neo-Platonic reading of Plato would be, at least in this central area, historically justified. This implies that Neo-Platonism is less of an innovation than it appears without the recognition of Plato's unwritten doctrines. Advocates of the Tübingen School emphasize this advantage of their interpretation. They see Plotinus as advancing a tradition of thought begun by Plato himself. Plotinus's metaphysics, at least in broad outline, was therefore already familiar to the first generation of Plato's students. This confirms Plotinus' own view, for he considered himself not the inventor of a system but the faithful interpreter of Plato's doctrines. At least two modern conferences within Hellenic philosophy fields of study have been held in order to address what Plotinus stated in his tract Against the Gnostics and to whom he was addressing it, in order to separate and clarify the events and persons involved in the origin of the term "Gnostic". From the dialogue, it appears that the word had an origin in the Platonic and Hellenistic tradition long before the group calling themselves "Gnostics"—or the group covered under the modern term "Gnosticism"—ever appeared. It would seem that this shift from Platonic to Gnostic usage has led many people to confusion. The strategy of sectarians taking Greek terms from philosophical contexts and re-applying them to religious contexts was popular in Christianity, the Cult of Isis and other ancient religious contexts including Hermetic ones (see Alexander of Abonutichus for an example). The Neoplatonic movement (though Plotinus would have simply referred to himself as a philosopher of Plato) seems to be motivated by the desire of Plotinus to revive the pagan philosophical tradition. [note 9] Plotinus was not claiming to innovate with the Enneads, but to clarify aspects of the works of Plato that he considered misrepresented or misunderstood. Plotinus does not claim to be an innovator, but rather a communicator of a tradition. Plotinus referred to tradition as a way to interpret Plato's intentions. Because the teachings of Plato were for members of the academy rather than the general public, it was easy for outsiders to misunderstand Plato's meaning. However, Plotinus attempted to clarify how the philosophers of the academy had not arrived at the same conclusions (such as misotheism or dystheism of the creator God as an answer to the problem of evil) as the targets of his criticism. Plotinus seems to be one of the first to argue against the still popular notion of causal astrology. In the late tractate 2.3, "Are the stars causes? ", Plotinus makes the argument that specific stars influencing one's fortune (a common Hellenistic theme) attributes irrationality to a perfect universe, and invites moral depravity. He does, however, claim the stars and planets are ensouled, as witnessed by their movement. The emperor Julian the Apostate was deeply influenced by Neoplatonism, as was Hypatia of Alexandria. Neoplatonism influenced many Christians as well, including Pseudo-Dionysius the Areopagite. St. Augustine, though often referred to as a "Platonist," acquired his Platonist philosophy through the mediation of the Neoplatonist teachings of Plotinus. To the Christian, the Other World was the Kingdom of Heaven, to be enjoyed after death; to the Platonist, it was the eternal world of ideas, the real world as opposed to that of illusory appearance. Christian theologians combined these points of view, and embodied much of the philosophy of Plotinus. [...] Plotinus, accordingly, is historically important as an influence in moulding the Christianity of the Middle Ages and of theology. The Eastern Orthodox position on energy, for example, is often contrasted with the position of the Roman Catholic Church, and in part this is attributed to varying interpretations of Aristotle and Plotinus, either through Thomas Aquinas for the Roman Catholics or Gregory Palamas for the Orthodox Christians. Neoplatonism and the ideas of Plotinus influenced medieval Islam as well, since the Sunni Abbasids fused Greek concepts into sponsored state texts, and found great influence amongst the Ismaili Shia. Persian philosophers as well, such as Muhammad al-Nasafi and Abu Yaqub Sijistani. By the 11th century, Neoplatonism was adopted by the Fatimid state of Egypt, and taught by their da'i. Neoplatonism was brought to the Fatimid court by Hamid al-Din al-Kirmani, although his teachings differed from Nasafi and Sijistani, who were more aligned with original teachings of Plotinus. The teachings of Kirmani in turn influenced philosophers such as Nasir Khusraw of Persia. As with Islam and Christianity, Neoplatonism in general and Plotinus in particular influenced speculative thought. Notable thinkers expressing Neoplatonist themes are Solomon ibn Gabirol (Latin: Avicebron) and Moses ben Maimon (Latin: Maimonides). As with Islam and Christianity, apophatic theology and the privative nature of evil are two prominent themes that such thinkers picked up from either Plotinus or his successors. In the Renaissance the philosopher Marsilio Ficino set up an Academy under the patronage of Cosimo de Medici in Florence, mirroring that of Plato. His work was of great importance in reconciling the philosophy of Plato directly with Christianity. One of his most distinguished pupils was Pico della Mirandola, author of An Oration On the Dignity of Man. In England, Plotinus was the cardinal influence on the 17th-century school of the Cambridge Platonists, and on numerous writers from Samuel Taylor Coleridge to W. B. Yeats and Kathleen Raine. Sarvepalli Radhakrishnan and Ananda Coomaraswamy used the writing of Plotinus in their own texts as a superlative elaboration upon Indian monism, specifically Upanishadic and Advaita Vedantic thought. Coomaraswamy has compared Plotinus' teachings to the Hindu school of Advaita Vedanta (advaita meaning "not two" or "non-dual"). Advaita Vedanta and Neoplatonism have been compared by J. F. Staal, Frederick Copleston, Aldo Magris and Mario Piantelli, Radhakrishnan, Gwen Griffith-Dickson, and John Y. Fenton. The joint influence of Advaitin and Neoplatonic ideas on Ralph Waldo Emerson was considered by Dale Riepe in 1967. The treatise as it stands in the Enneads is a most powerful protest on behalf of Hellenic philosophy against the un-Hellenic heresy (as it was from the Platonist as well as the orthodox Christian point of view) of Gnosticism. There were Gnostics among Plotinus's own friends, whom he had not succeeded in converting (Enneads ch.10 of this treatise) and he and his pupils devoted considerable time and energy to anti-Gnostic controversy (Life of Plotinus ch.16). He obviously considered Gnosticism an extremely dangerous influence, likely to pervert the minds even of members of his own circle. It is impossible to attempt to give an account of Gnosticism here. By far the best discussion of what the particular group of Gnostics Plotinus knew believed is M. Puech's admirable contribution to Entretiens Hardt V (Les Sourcesde Plotin). But it is important for the understanding of this treatise to be clear about the reasons why Plotinus disliked them so intensely and thought their influence so harmful. Short statement of the doctrine of the three hypostasis, the One, Intellect and Soul; there cannot be more or fewer than these three. 1. Criticism of the attempts to multiply the hypostasis, and especially of the idea of two intellects, one which thinks and that other which thinks that it thinks. (Enneads Against the Gnostics ch. 1). The true doctrine of Soul (ch. 2). 2. - The law of necessary procession and the eternity of the universe (ch. 3). - Attack on the Gnostic doctrine of the making of the universe by a fallen soul, and on their despising of the universe and the heavenly bodies (chs. 4–5). - The sense-less jargon of the Gnostics, their plagiarism from and perversion of Plato, and their insolent arrogance (ch. 6). 3. The true doctrine about Universal Soul and the goodness of the universe which it forms and rules (chs. 7–8). 4. Refutation of objections from the inequalities and injustices of human life (ch. 9). 5. Ridiculous arrogance of the Gnostics who refuse to acknowledge the hierarchy of created gods and spirits and say that they alone are sons of God and superior to the heavens (ch. 9). 6. The absurdities of the Gnostic doctrine of the fall of "Wisdom" (Sophia) and of the generation and activities of the Demiurge, maker of the visible universe (chs. 10–12). 7. False and melodramatic Gnostic teaching about the cosmic spheres and their influence (ch. 13). 8. The blasphemous falsity of the Gnostic claim to control the higher powers by magic and the absurdity of their claim to cure diseases by casting out demons (ch. 14). 9. The false other-worldliness of the Gnostics leads to immorality (ch. 15). 10. The true Platonic other-worldliness, which love and venerates the material universe in all its goodness and beauty as the most perfect possible image of the intelligible, contracted at length with the false, Gnostic, other-worldliness which hates and despises the material universe and its beauties (chs. 16–18). 9. The false other-worldliness of the Gnostics leads to immorality (Enneads ch. 15). ^ "... as Plotinus had endeavored to revive the religious spirit of paganism". ^ a b c Stanford Encyclopedia of Philosophy Plotinus. ^ "Plotinus." The Columbia Electronic Encyclopedia, Sixth Edition. Columbia University Press, 2003. ^ "Plotinus." The Concise Oxford Companion to Classical Literature. Oxford University Press, 1993, 2003. ^ Bilolo, M.: La notion de « l’Un » dans les Ennéades de Plotin et dans les Hymnes thébains. Contribution à l’étude des sources égyptiennes du néo-platonisme. In: D. Kessler, R. Schulz (Eds. ), "Gedenkschrift für Winfried Barta ḥtp dj n ḥzj" (Münchner Ägyptologische Untersuchungen, Bd. 4), Frankfurt; Berlin; Bern; New York; Paris; Wien: Peter Lang, 1995, pp. 67–91. ^ Porphyry, On the Life of Plotinus and the Order of His Books, Ch. 3 (in Armstrong's Loeb translation, "he became eager to make acquaintance with the Persian philosophical discipline and that prevailing among the Indians"). ^ Porphyry, Vita Plotini, 9. See also Emma C. Clarke, John M. Dillon, and Jackson P. Hershbell (1999), Iamblichus on The Mysteries, page xix. SBL. who say that "to gain some credible chronology, one assumes that Ariston married Amphicleia some time after Plotinus's death"
^ Mark Edwards, Neoplatonic Saints: The Lives of Plotinus and Proclus by Their Students, Liverpool University Press, 2000, p. 4 n. 20. ^ Plotinus (1950). The philosophy of Plotinus: representative books from the Enneads. Appleton-Century-Crofts. p. vii. Retrieved 1 February 2012. ^ E. R. Dodds, 'The Parmenides of Plato and the Origin of the Neoplatonic One,' The Classical Quarterly, v. 22, No. 3/4, 1928, pp. 129-142, esp. 140. ^ Philip Merlan, From Platonism to Neoplatonism (The Hague: Martinus Nijhoff, 1954, 1968), p. 3. ^ Detlef Thiel: Die Philosophie des Xenokrates im Kontext der Alten Akademie, München 2006, pp. 197ff. and note 64; Jens Halfwassen: Der Aufstieg zum Einen. ^ Dingeldein, Laura B. (2016). "Julian's Philosophy and His Religious Program". In DesRosiers, Nathaniel P.; Vuong, Lily C. Religious Competition in the Greco-Roman World. Atlanta: SBL Press. pp. 119–129. ISBN 978-0884141587. ^ Michael A. B. Deakin (2018-02-22). "Hypatia". Encyclopædia Britannica. Archived from the original on 2018-03-26. ^ W. R. Inge (April 1900). "The Permanent Influence of Neoplatonism upon Christianity". The American Journal of Theology. 4 (2): 328–344. JSTOR 3153114. ^ Rhodes, Michael Craig (2014). "Pseudo-Dionysius' concept of God". International Journal of Philosophy and Theology. 75 (4): 306–318 – via Taylor & Francis. ^ Mendelson, Michael (2016). "Saint Augustine". In Edward N. Zalta. The Stanford Encyclopedia of Philosophy (Winter 2016 ed.). Stanford: Metaphysics Research Lab, Stanford University. ^ Gersh, Stephen (2012). "The First Principles of Latin Neoplatonism: Augustine, Macrobius, Boethius". Vivarium. 50 (2): 113–117, 120–125, 130–132, 134–138. JSTOR 41963885. ^ a b Heinz Halm, Shi'ism, Columbia University Press, 2004, p. 176. ^ a b Heinz Halm, Shi'ism, Columbia University Press, 2004, p. 177. ^ Frederick Charles Copleston. "Religion and the One 1979–1981". Giffordlectures.org. Archived from the original on 2010-04-09. Retrieved 2010-01-08. ^ "Creator (or not?)". Gresham.ac.uk. Retrieved 2010-01-08. Émile Bréhier, Plotin: Ennéades (with French translation), Collection Budé, 1924–1938. Paul Henry and Hans-Rudolf Schwyzer (eds. ), Editio maior (3 volumes), Paris, Desclée de Brouwer, 1951–1973. Paul Henry and Hans-Rudolf Schwyzer (eds. ), Editio minor, Oxford, Oxford Classical Text, 1964–1982. Plotinus. The Enneads (translated by Stephen MacKenna), London, Medici Society, 1917–1930 (an online version is available at Sacred Texts); 2nd edition, B. S. Page (ed. ), 1956. Lloyd P. Gerson (ed. ), George Boys-Stones, John M. Dillon, Lloyd P. Gerson, R.A. King, Andrew Smith and James Wilberding (trs.). The Enneads. Cambridge University Press, 2018. Erik Emilsson, Plotinus, New York: Routledge, 2017. Michael Atkinson, Plotinus: Ennead V.1, On the Three Principal Hypostases, Oxford, 1983. Kevin Corrigan, Plotinus' Theory of Matter-Evil: Plato, Aristotle, and Alexander of Aphrodisias (II.4, II.5, III.6, I.8), Leiden, 1996. John N. Deck, Nature, Contemplation and the One: A Study in the Philosophy of Plotinus, University of Toronto Press, 1967; Paul Brunton Philosophical Foundation, 1991. Barrie Fleet, Plotinus: Ennead III.6, On the Impassivity of the Bodiless, Oxford, 1995. W. Helleman-Elgersma, Soul-Sisters. A Commentary on Enneads IV, 3 (27), 1–8 of Plotinus, Amsterdam, 1980. James Luchte, Early Greek Thought: Before the Dawn. London: Bloomsbury Publishing, 2011. ISBN 978-0567353313. Kieran McGroarty, Plotinus on Eudaimonia: A Commentary on Ennead I.4, Oxford, 2006. P. A. Meijer, Plotinus on the Good or the One (VI.9), Amsterdam, 1992. H. Oosthout, Modes of Knowledge and the Transcendental: An Introduction to Plotinus Ennead V.3, Amsterdam, 1991. J. Wilberding, Plotinus' Cosmology. A study of Ennead II. 1 (40), Oxford, 2006. A. M. Wolters, Plotinus on Eros (eNN. III.5), Amsterdam, 1972. Robert M. Berchman, From Philo to Origen: Middle Platonism in Transition, Chico, Scholars Press, 1984. Pauliina Remes, Neoplatonism (Ancient Philosophies), University of California Press, 2008. R. B. Harris (ed. ), Neoplatonism and Indian Thought, Albany, 1982. Giannis Stamatellos, Plotinus and the Presocratics. A Philosophical Study of Presocratic Influences in Plotinus' Enneads, Albany, 2008. Antonia Tripolitis, The Doctrine of the Soul in the thought of Plotinus and Origen, Libra Publishers, 1978. M. F. Wagner (ed. ), Neoplatonism and Nature. Studies in Plotinus' Enneads, Albany, 2002. Direct links to each Tractate of the Enneads in English, Greek and French. Plotinus, The Six Enneads, translated by Stephen MacKenna (with B. S. Page), at Sacred Texts. The Internet Classics Archive of MIT The Six Enneads, translated into English by Stephen MacKenna and B.S. Page. On the Intelligible Beauty, translated by Thomas Taylor Ennead V viii(see also the Catalog of other books which include Porphyry, Plotinus' biographer - TTS Catalog). Gerson, Lloyd P. "Plotinus". In Zalta, Edward N. Stanford Encyclopedia of Philosophy. Moore, Edward. "Plotinus". Internet Encyclopedia of Philosophy. In English, by Richard Dufour. In French by Pierre Thillet. This page was last edited on 30 March 2019, at 19:00 (UTC).